"Using microphone arrays and advanced beamforming technology"
Beamforming is a signal processing technique carried out by a processor using input from the beamforming microphone array. Advanced beamforming techniques employ interference patterns to change the directionality of the array, so that information collected from the various microphones can be combined to give preference to the expected acoustic patterns. With good design and engineering, it’s now possible to employ an advanced microphone array system to capture desired sounds and produce a highly intelligible, superior-quality audio signal. 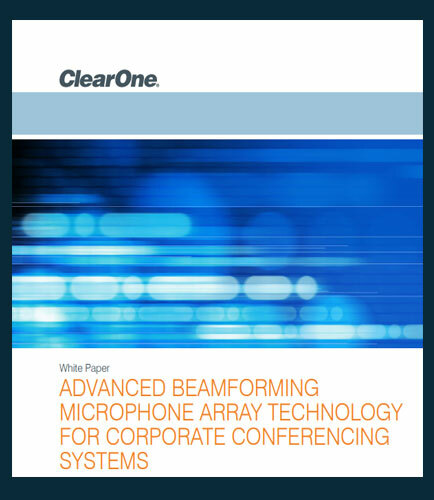 This whitepaper focuses on beam-forming as a method of sensing and filtering acoustic waves for enterprise video and telephone conferencing applications.